SCORES of eager Crows and Power fans have been queuing for AFL finals tickets, forcing Ticketek to put on extra staff to cope with the huge demand. THE AFL finals will be declared as a major event under tough anti-scalping rules to protect fans — despite the Tourism Minister saying the “hype” of scalping doesn’t live up to the reality. Tourism Minister Leon Bignell confirmed he would make the AFL finals a “major event” — which offers more protection for fans against scalpers. The AFL has warned fans to only purchase finals tickets through approved sellers Ticketek as the ACCC launches legal action against ticket resale website Viagogo, which has duped unsuspecting AFL fans in the past. 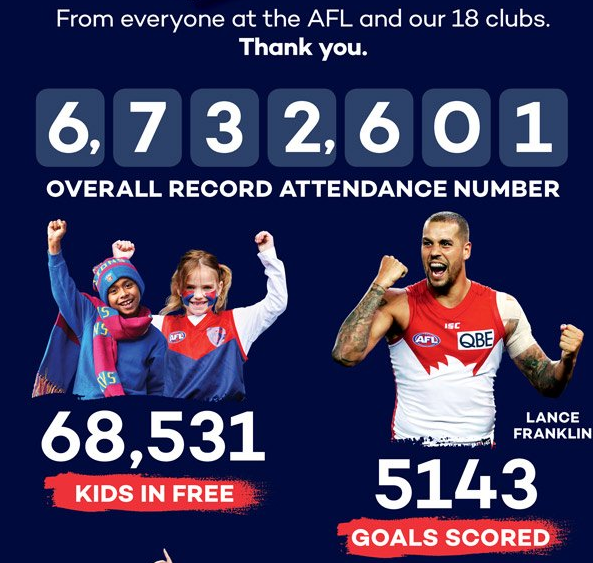 The “Buddy effect” and Sydney’s rags to riches tilt at the flag are proving a box-office hit, with the Swans faithful flocking to the club in numbers rivalling the Tony Lockett-era. Essendon’s journey back into September is set to be marked by a record profit of more than $4 million, in a result the Bombers hope will help make them debt free within 18 months. AFL Women’s players are set to receive a significant pay rise despite being just one year into their two-year collective bargaining agreement. The AFL Commission and league bosses could not reach a resolution on the expansion of the AFL Women’s competition at Tuesday’s day-long board talks in Geelong and have put off a decision on the distribution of new licences until grand final week. The Western Australian revealed the NRL is planning to host back-to-back games at the new Perth Stadium on Saturday, March 10. Why the heck is the NRL opening the new Perth Stadium? A WA football legend has slammed the decision to allow rugby league to be the first football code to headline Perth’s new stadium. Australian Rugby Union chief executive Bill Pulver says billionaire Andrew “Twiggy” Forrest was simply too late to the table with a stunning $50 million offer to prop up the Western Force and assure the future of the code. Force billionaire backer Andrew Forrest says he has evidence dismissing Australian Rugby Union claims that it wanted to axe the Western Force because of financial concerns, playing performance and support. Fewer than 2,000 tickets are left for #AUSvBRA at Penrith’s Pepper Stadium. The boss of one of Australia’s biggest media businesses, MediaCom’s Sean Seamer (pictured below), believes sports rights – primarily the NRL and the AFL – will now be firmly in the sights of Network Ten’s new owners, CBS. Optus is reportedly looking to expand its cricket broadcast rights.